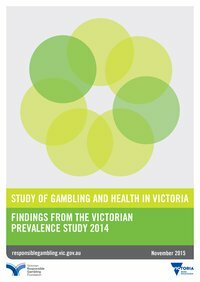 The Study of gambling and health in Victoria presents findings from a 2014 exploration into participation in gambling in Victoria and the prevalence of problem and at-risk gambling. This is the first major study to measure problem gambling in Victoria in six years. The report compares findings with those of a 2008 survey published in A study of gambling in Victoria – problem gambling from a public health perspective (Hare, 2009). The study involved a telephone survey of 13,584 randomly selected Victorian adults and included mobile-only households for the first time. It was funded by the Victorian Responsible Gambling Foundation and the Department of Justice and Regulation, and undertaken by Schottler Consulting. The study found while fewer people are gambling, those who are gambling are betting more often and spending more. Participation in gambling decreased from 2008 to 2014. In particular, participation in gaming machines declined from 21.46 per cent to 16.74 per cent. The prevalence of problem gambling in adult Victorians is 0.81 per cent (35,500 people). While the percentage has not changed significantly since 2008, this group is gambling more intensively and spending more. Participation in sports betting increased from 3.96 per cent to 4.82 per cent, with online now the most common way to bet on sports. There was a significant increase in sports betting participation among problem gamblers. People whose gambling is in the 'problem' category, meaning they are likely to be experiencing significant harm from their gambling, are much more likely to identify as Aboriginal or Torres Strait Islander. The prevalence of problem gambling in Aboriginal or Torres Strait Islander participants is 8.71 per cent. People in the problem gambling category are more likely to be aged 35 to 44, which is older than has been found in previous studies. The prevalence of low-risk gambling has increased from 5.7 per cent in 2008 to 8.91 per cent (391,000 adult Victorians). This is linked to a significant increase in low-risk gambling in women aged 35 to 44. While 22 per cent of people in the problem category said they had sought help in the past 12 months, only 1.88 per cent of moderate-risk gamblers sought help – this includes both formal and informal help. This study is a point-in-time measure of problem and at-risk gambling in Victoria. It is an important benchmark to track trends in gambling participation and other gambling behaviour. increased efforts to encourage more people to recognise the signs of an emerging problem and to seek help early. Sarah Hare - Schottler consulting 2015, Study of gambling and health in Victoria: findings from the Victorian Prevalence Study 2014, Victorian Responsible Gambling Foundation and Victorian Department of Justice and Regulation, Melbourne.